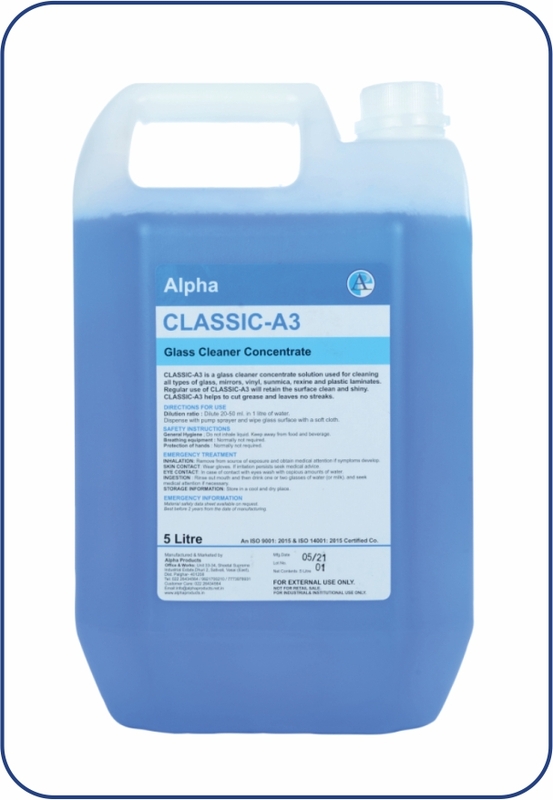 CLASSIC-A3 is a glass cleaner concentrate solution for cleaning all types of glass, mirrors, vinyl, sun mica, rexine and plastic laminates. Regular use of CLASSIC-A3 will retain the surface clean and shiny. CLASSIC-A3 helps to cut grease and leaves no streaks. Dilution ratio: Dilute 20 - 50 ml in 1 litre of water. Dispense with pump sprayer and wipe glass with clean cloth. Unplug all electrical appliances before use. In case of contact with eyes, rinse with plenty of water and if necessary seek medical advice.